On March First 1936, the Hoover Dam was is completed in the U.S.
On March First 1954, U.S.A. tested a Hydrogen Bomb at Marshall Islands. March First! During the long and short span of human history, many events happened on this day. However, the same can be said of any other day on the calendar. Things happen all throughout the calendar year. No single day is an exception. However, not many countries have decided to commemorate the 1st of March as a national holiday. This is a big holiday in Korea! It is a “Jeol” after all! What did I just say? “Jeol”? As a culture that was subordinate to China for a long time, Chinese words are used as prestigious meanings like what Americans do with Latin words. Hi from Korea. This is Professor AKIA and today I’m here to talk about the March First, a Korean national holiday. So, why is the first of March important here in Korea? We’ll need to do story time to explain. Turn back the clock by a century. Our story starts in 1910. William Howard Taft is the President of America. It has only been 7 years since the Wright Brothers made the first powered flights in 1903. It is 4 years before the start of the first world war. And it is the year when the feudal Monarchy of Korea finally ended to be replaced by the rule of the Japanese. Up to that point in time, Korea was ruled by a traditional Monarchy in which the right to rule over the people was passed on from generation to generation by birth right. So, in a way, the Japanese occupation could be seen as a transfer of the right to rule from one “Korean” family to another “Japanese” family rather than an invasion of sorts. I mean there was no war! For an event that ended a 500 year reign, the dynasty didn’t go out with a bang. The dynasty that ruled the country more or less just got absorbed into the Japanese aristocracy. There was no widespread nationalistic uprising because the concept of being a “nation” which had been previously imported just a few years ago into the region had not fully taken root yet. What I mean is that there were no “Koreans” to rise up against the takeover. Just folks formerly ruled by a dynasty divided by class, region, and a legacy of being oppressed. There was not a sense of a unified people with a common history and destiny. However, this was going to change on the first of March 1919 as the “Koreans” was waiting to be born. On November 11, 1918 the first world war ended and Japan was on the side that was victorious. It was a moment proving that Japan had truly arrived as a global power. However, not all was smooth sailing for Japan as their Korean provinces were just about the heat up. In January of the following year, 1919, the last Monarch of Korea died under a cloud of suspicion of foul play. Conspiracy theories circulating like crazy fanning the sparks of national identity that was starting to kindle. In this atmosphere, the date of the funeral was set for March 3rd 1919 providing the opportunity for the people to congregate all around the country including the capital under the veil of sending off their former King. In a way, the best thing the last king of Korea, whose reign was marked by failure, did was dying at the right moment. On the first of March, this mass of angry and emotional people erupted into a country wide demonstration that spanned all classes and walks of life. In that moment, the notion of being a “Korean” was born. Objectively, nothing good came from this event. While the demonstrations lasted for months, the occupational forces broke up the demonstrations eventually. In the subsequent years, they succeeded in breaking back bone of the burgeoning resistance within the country. Thus, the remaining resistance were scattered beyond the country and didn’t achieve much significant results until the Americans’ victory in the pacific. In fact, things got much worse because of the demonstrations as the Japanese started to take their occupational duties more seriously. In the immediate years since the start of the occupation, the Japanese were more lax in their control. Yet, “March First” Day is one of the only 3 Korean holidays indicated by the word “Jeol.” It is that important to Koreans. While it is objectively a failed attempt to achieve its intended goals, one has to start somewhere. 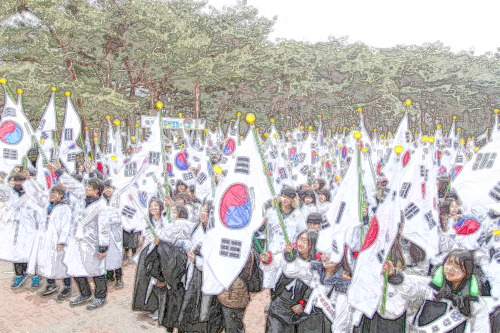 When modern Koreans trace back to the source of their identity, “March First” Day is where end up at. It is the birth day of modern Koreans!